OTTAWA – February 28, 2015. 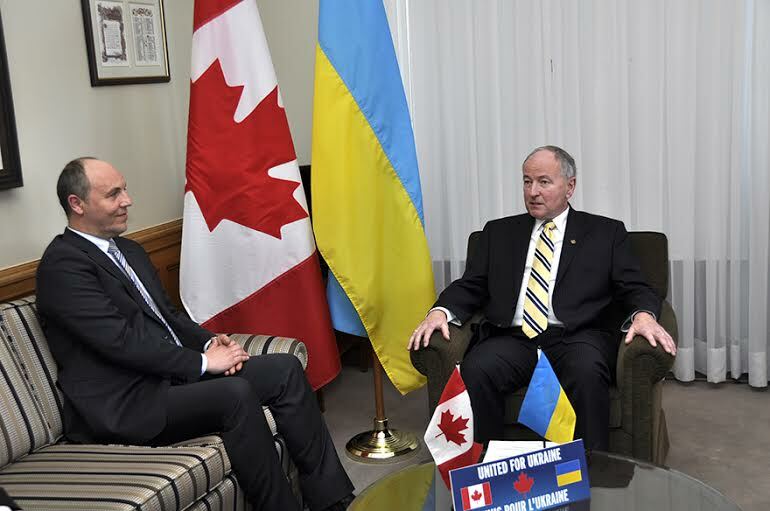 The First Deputy Speaker of Ukraine’s Parliament, Andriy Parubiy, completed an official visit to Canada (February 21-24). Mr. Parubiy came to Canada for an official visit prior to departing for an official visit to Washington, DC. Invited by House of Commons Speaker the Hon. Andrew Scheer, Mr. Parubiy arrived in Canada on Saturday, February 21, 2015, and was greeted at Pearson International Airport by a delegation led by UCC Toronto President Taras Bahriy. During his 2 day stay in Toronto, Mr. Parubiy also met with UCC President Paul Grod, Euromaidan Canada Chair Marc Shwec, Charge D’Affaires of the Ukrainian Embassy in Canada Marko Shevchenko and UCC Executive Director Taras Zalusky. On Saturday evening, an expanded meeting of UCC’s Advisory Council was held with Mr. Parubiy to discuss the current situation in Ukraine. A busy Toronto schedule continued on Sunday with a meeting with community members at Buduchnist Credit Union. After this, Mr. Parubiy attended the Divine Liturgy at St. Demetrius parish. 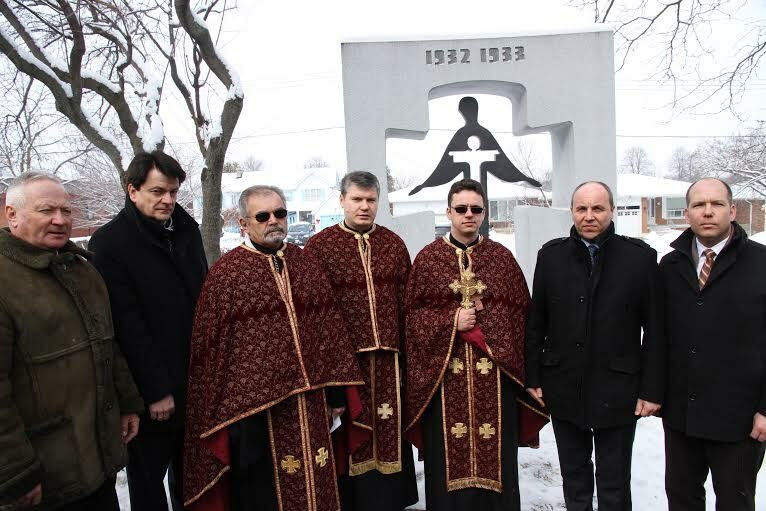 Following the church service, a Panakhyda service was held at the Holodomor monument outside the church to pay respects to those who perished as part of the Nebesnya Sotnia, as well as those who have perished defending Ukraine from Russian aggression over the past year. Mr. Parubiy met with Toronto’s Euromaidan activists for a vibrant question and answer session at the Huculak Centre. This was followed by a series of media interviews. Sunday’s highlight was undoubtedly the fundraising reception and dinner “Tribute to the Brave Defenders of Ukraine” held at the Golden Lion restaurant. Attended by 400 people, the event was emceed by Mr. Marc Shwec and was a solemn commemoration of the Heavenly Hundred (Nebesna Sotnia). 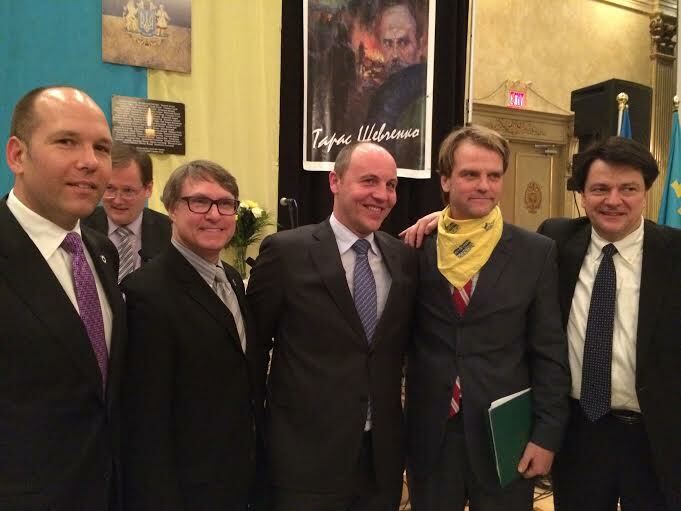 “Andriy Parubiy brought with him a true spirit of the new generation of politicians in Ukraine, free of corruption and dictatorship, with a European democratic tradition,” said Shwec, Chair of Euromaidan Canada. As part of his official visit at the invitation of House of Commons Speaker Andrew Scheer, Mr. Parubiy was hosted by Speaker Scheer for a lunch in the Speaker’s dining room along with dignitaries including Members of Parliament from all parties: Wladislaw Lizon, Ted Opitz, Hon. Geoff Regan, Mike Wallace, James Bezan, Marc Garneau, Alexandrine Latendresse, Bernard Trottier, Parliamentary Secretary to the Minister of Foreign Affairs, and Senator David Tkachuk. After the luncheon, Parubiy attended the daily Question Period in the House of Commons and was formally recognized and welcomed by Speaker Andrew Scheer. 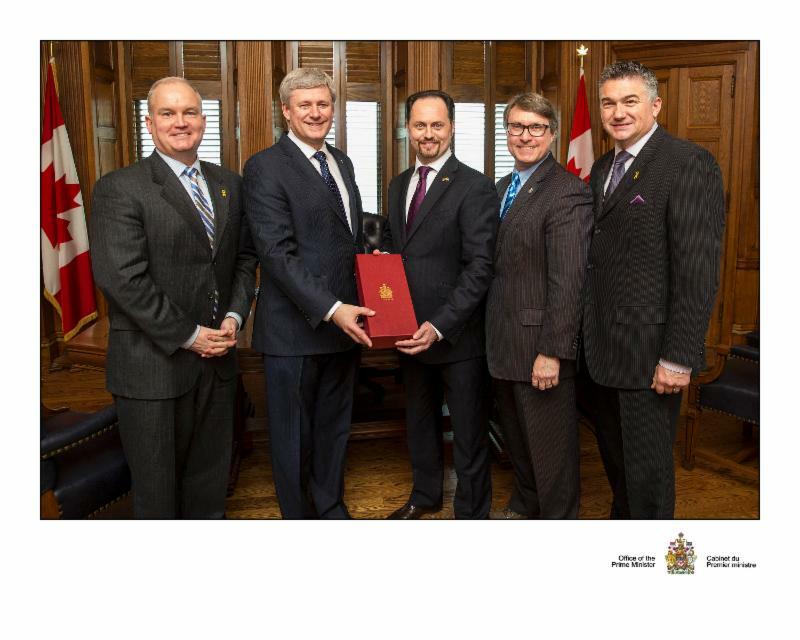 Following Question Period, he met with Canada’s Minister of Foreign Affairs, the Honourable Rob Nicholson, M.P., P.C. At the joint media availability Mr. Nicholson said Ottawa is against any violation of the Minsk ceasefire. 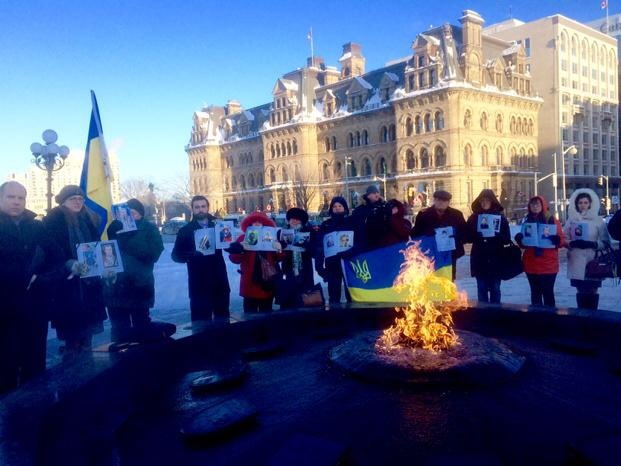 “Any attempt to reduce or take away Ukraine’s sovereignty in that way is completely opposed by Canada.” Mr. Parubiy then braced the frigid Ottawa cold (close to minus 40 degrees Celsius) and attended a solemn commemoration of the Nebesna Sotnia at the Centennial Flame, organized by UCC Ottawa and Euromaidan Ottawa. 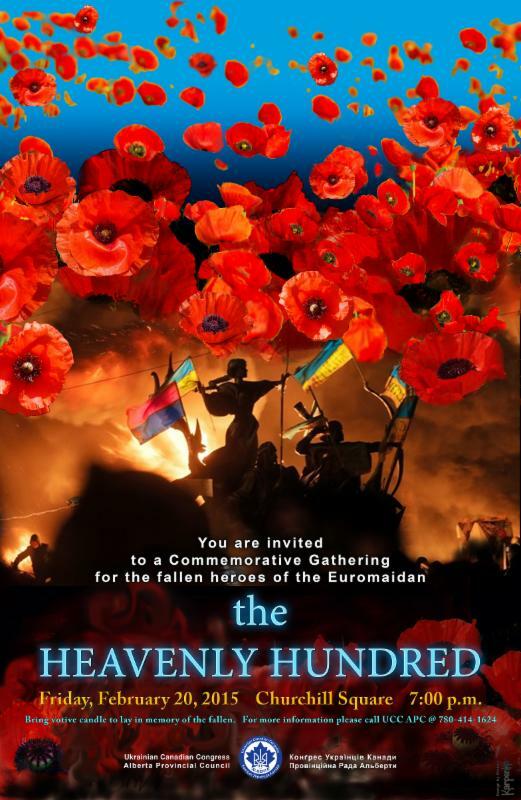 Between February 19 and March 1, Commemorations for the Heavenly Hundred were held across the country. In addition to local Ukrainian communities, the Embassy of Ukraine in Canada held a commemoration on Friday February 20. 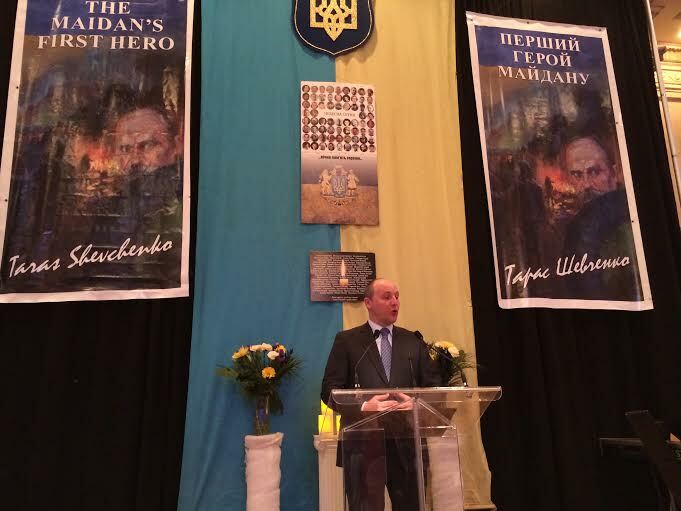 The First Deputy Chairman of the Parliament of Ukraine, Mr. Andriy Parubiy visited Canada and in addition to being a keynote speaker at the commemoration banquet in Toronto, joined the Ottawa community in a special service held at the Confederation Flame on Parliament Hill on Monday February 23. On Sunday March 1, 2015, an International Day of Support was held for Nadiya Savchenko. Nadiya Savchenko, a Ukrainian air force pilot and elected member of Ukraine’s parliament, has appealed to Ukrainians worldwide for their support in her immediate release. Ms. Savchenko was captured on June 18, 2014 in Luhansk oblast and was illegally transferred to Russia where she has been charged with the deaths of two Russian journalists. She was subsequently charged with “illegally crossing the border”. 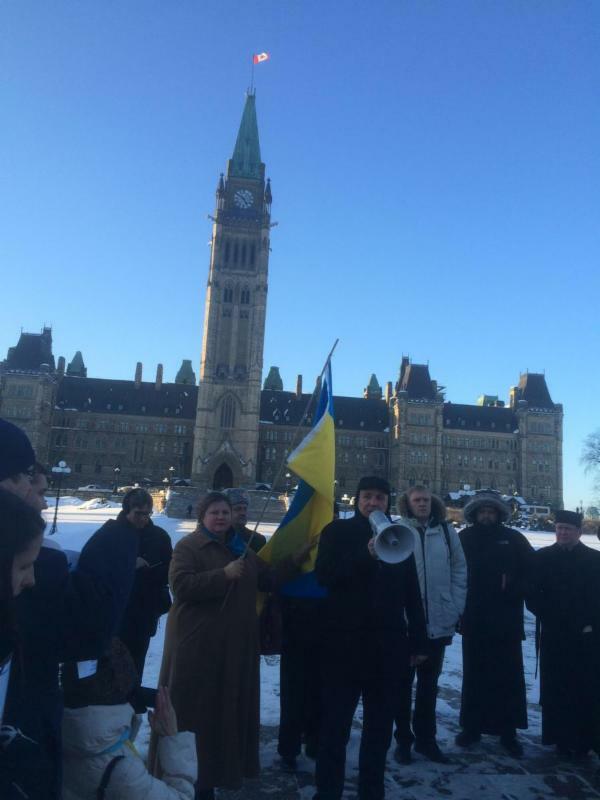 A Global Day of Action was held on January 26, 2015, to kick off a worldwide call to support the release of Savchenko. Demonstrations took place in roughly 54 cities across the world. 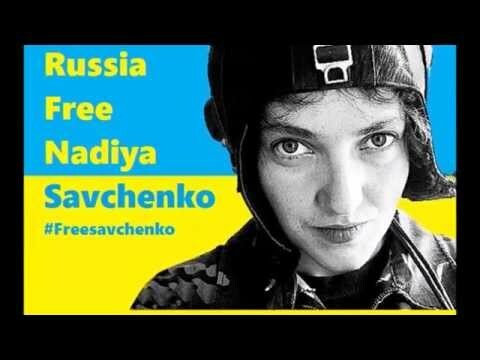 On March 8, 2015 – International Women’s Day – The World Federation of Ukrainian Women Organizations calls upon women around the world to unite in support of Nadiya Savchenko by joining Nadiya Savchenko in her hunger strike for one day. She is being held in prison in Moscow where she awaits a trial date in May 2015 on charges that she provided the coordinates of two Russian journalists who were killed in a mortar attack in the Luhansk region. Savchenko denies the charges and cell phone records confirm that she was in the custody of Russian forces when the journalists were killed. Since December 13, 2014, Nadia has been on a hunger strike protesting her illegal detention. She has lost 17 kilograms (37 pounds) or 26% of her body weight. Her situation is critical. Show your support for Nadiya Savchenko by joining this international hunger strike. Notify local media to bring attention to Nadiya’s critical situation and call for her immediate release. Local events can include demonstrations, marches, vigils or meetings in community centres or even private homes. Invite a speaker, send articles to local newspapers, issue a media advisory, publicize your event on social media, send messages of support to Nadiya, upload photos and reports about your event to the Nadiya Savchenko Facebook page. (https://www.facebook.com/nadiyasavchenko1). Donations equivalent to the cost of food you would have consumed on this day can be made to the Patriot Defence Fund (www.patriotdefence.org) in support of Ukraine’s army. Join us in supporting Nadiya. Together we can make a difference. We call on all Canadians to support Savchenko’s release using the hashtag #FreeSavchenko on social media, organizing local rallies and demonstrations and informing the media about this pressing issue. 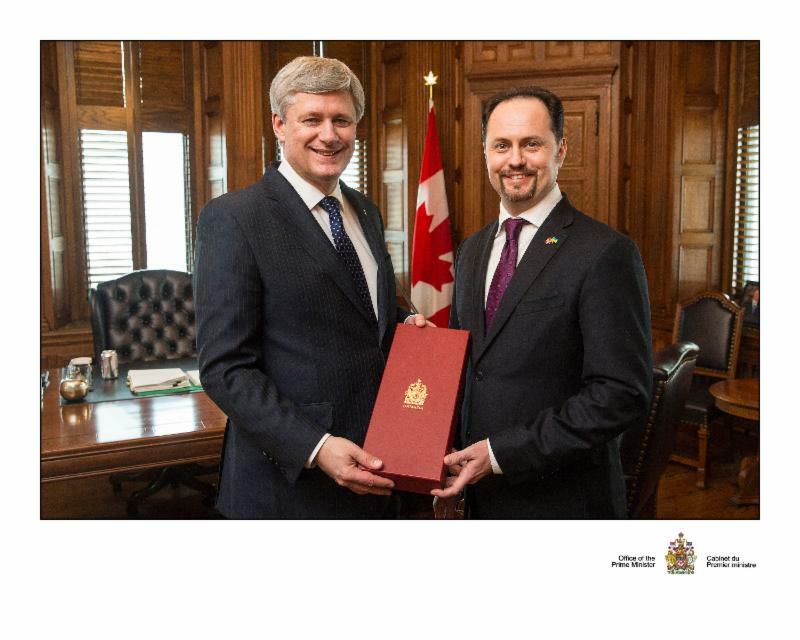 The Ukrainian Canadian Congress would like to congratulate Mr. Ihor Kozak for being awarded a Canadian flag by Prime Minister Stephen Harper in recognition of his significant contributions to Canada and the well-being of its citizens. This award comes in light of our flag’s 50th anniversary and Mr. Kozak is one of 50 individuals and organizations that have significantly contributed to our country. Mr. Kozak was nominated by three MP’s, Minister Erin O’Toole, Mr. James Bezan and Mr. Ted Opitz, all three of whom have worked with Mr. Kozak in the military or through community work. Mr. Kozak served our country as a decorated officer in the Canadian Forces, at home and abroad, and was decorated twice for his outstanding leadership. Upon retirement from the Forces, he obtained an MBA and has become a successful entrepreneur. Post-military life, he has become an influential member of the Ukrainian community, dedicating tremendous amounts of time in addressing the issue of the crisis of Ukraine to the government and urging for Canada to continue its support. He has also been instrumental in his ground work in Ukraine, where he was involved in the delivery and distribution of Canadian aid to the people of Ukraine and the soldiers on the eastern front, ensuring the process was effective and accountable. 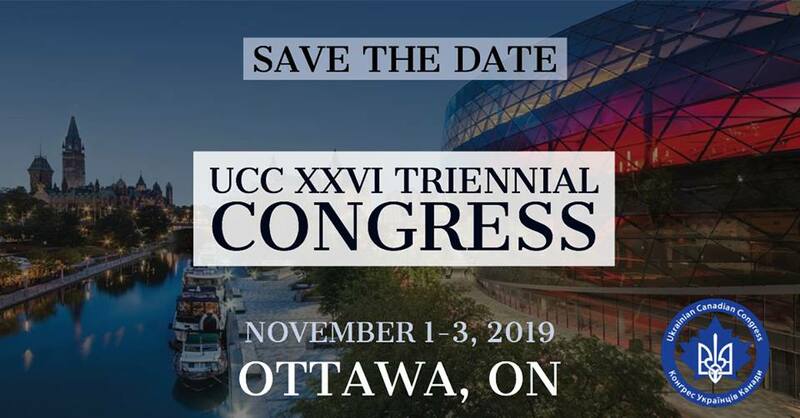 The UCC is extremely proud of Mr. Kozak and this achievement is a reflection of the contributions and influence that our community has provided to Canada. We thank Mr. Kozak once more for his tireless dedication and hard work to our community and causes. He has inspired us to continue our work, from our local chapters to the provincial and national levels, for he is an example of what can be achieved with resilience and determination in upholding out heritage and identity in this vast multicultural country. Shevchenko is national symbol of Ukraine and it’s most famous poet. He was born in 1814 into a peasant family and lost both parents by the age of 11. As an orphan, Taras set out to find a painting master to further develop his love for art. He spent many years developing his painting skills and writing poetry in his private spare time. In 1831, then master Pavel Engelgardt took him to Saint Petersburg and gave him to painter Vasily Shiriayev for arts studies. Taras remained there until he met great Russian painter Karl Bruillov who bought Shevchenko’s freedom in 1838. Shevchenko began to compile his poems and published his most famous work Kobzar, in 1840. He produced numerous works and made several trips back to his native Ukraine during this decade but the difficult conditions in which his people were living took a toll on him. In 1845, he joined a pro-Ukraine society that was dedicated to the Ukrainian identity and strengthening its voice. His poem the Dream which outlined the brutal suppression of the Ukrainian people and berated the Imperial Empire for its heinous acts. The poem was confiscated by authorities and Shevchenko was arrested in 1847. Tsar Nicholas I read this poem and ridiculed Shevchenko’s attempt at raising awareness of the Ukrainian language and identity and became enraged when his wife was defamed in the poem. Shevchenko was exiled to Siberia (1850) and was to be stripped of any tools or mediums in order to prevent him from writing or painting. This was not strictly adhered to and he was able to compile more works. After ten years, he was granted a pardon and ordered to return to Saint Petersburg. In May 1859, he was allowed to return to Ukraine, however shortly after he was arrested again and sent back to Saint Petersburg in September 1959. There he died in 1861, from difficult conditions in exile and prolonged illness. Later, at his bequest in his opus Zapovit (Testament), his remains were moved to Ukraine. He is buried near the city Kaniv, on a hill overlooking the Dnipro river. March 9th is a special day of gathering and remembrance among Ukrainians in Canada and around the world for many decades, celebrating the birth of Ukraine’s bard who has been internationally recognized for his significant artistic work and contributions to the formation of a Ukrainian national identity. He is considered the father of Ukrainian nationalism and one of the founders of Ukrainian literature. 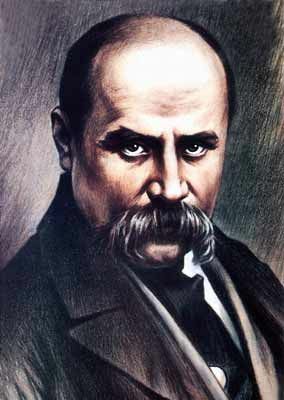 Few men have had a more profound impact on Ukraine than Taras Shevchenko. His contributions are significant. During the 47 years of his brief but relentless life, Shevchenko produced numerous poems and artworks, which are valued and respected around the world. His most prominent work Zapovit was translated into over 100 languages. Today as the citizens of Ukraine rise up in the name of democracy, freedom and their right to self-determination, the words of Taras Shevchenko remain close to their and our hearts. Shevchenko’s poetry contributed to the growth of Ukrainian national consciousness, and his influence on Ukrainian intellectual, literary, and national life is still felt to this day. UCC encourages community organizations to remember the impact of Shevchenko’s work and commemorate his life and legacy through art, word, and song. The Canadian First World War Internment Recognition Fund commemorative Internment stamps are available for purchase.The booklet of 12 costs 15 dollars and is available through UCC Head Office on Winnipeg, UCC National Office in Ottawa, the Shevchenko Foundation as well as local branches. The value of each stamp is 85 cents.